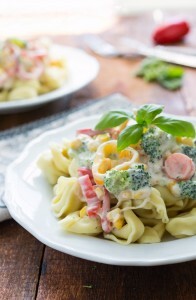 A creamy tortellini bake filled with summer veggies! This bake is sure to be a crowd pleaser! I can not believe it is June already. Where has this ENTIRE year gone?! Time goes by way too quickly! HOWEVER… it is nice to be here at summer and already enjoying some very summery foods 🙂 I broke out the healthy zucchini bread last week along with a few frozen desserts (this lemon berry slush being my favorite!) already. I’m in full-blown summer mode now! And the babe is loving summer. He’s outside pretty much all the time and loves exploring AKA throwing dirt and rocks everywhere. We’ve also got to babysit my in-laws little dog (Mazie) while they are vacationing and he’s absolutely crazy about her. Even if the affection is not quite returned… In fact, poor Mazie is terrified of little Grey. But back to speaking of summery foods, doesn’t this meal just scream summer? Tons of summer veggies (that could be coming from your garden if you are super cool like that! ), a lighter creamy base, and pasta in it’s very best form (tortellini obviously!). Plus it’s a pretty simple meal which is perfect for summer when you really just want to be outside enjoying the weather instead of inside slaving over a meal all day. Also, the great news for this dish is you can pretty much pick and choose what veggies you add in here. I say, the more different kinds of veggies the merrier, but I’m quite the veggie lover. If you are not, pick your favorites and just increase the amounts to the total amounts I have listed in the recipe. Annnd for the creamy base. It’s a pretty standard and easy cream base, but with CREAM CHEESE added which is such a delicious change to your typical cream base. Plus it complements those cheesy tortellini’s quite well! In the recipe, I’ve called for vegetable or tomato broth to ensure this recipe is vegetarian, but if you aren’t concerned about having a completely vegetarian meal, chicken broth will work fine as a replacement for that broth. And, on the flip side of a vegetarian meal, you can definitely add some chicken to this dish if desired. I’ve made it with chicken just by cutting up small chunks of chicken and cooking them all the way through. Then just add the cooked chicken chunks to the veggie tortellini mixture. Truth be told though, both the husband and I preferred this dish without the chicken – the real star is all those veggies and of course the cheesy tortellini! Preheat the oven to 350 degrees F. Generously grease a 9 x 13 casserole dish and set aside. Prep the veggies: trim the snap peas, peel and coin the carrot, thinly slice the mushrooms, chop the peppers, chop the summer squash, halve the cherry tomatoes, and rinse & drain the corn. Prepare the tortellini according to package directions. In the last minute of boiling the noodles, add in the sugar snap peas and carrots. Meanwhile, add 2 tablespoons olive oil to a skillet. Over medium heat sauté the mushrooms, peppers, and summer squash until crisp tender. Drain the tortellini, snap peas, and carrots and return to pot. Add in the sautéed mushrooms, peppers, and summer squash. Add in the cherry tomatoes and can of corn. In a small pot (or use the same skillet you used to sauté the veggies if it will work), melt the butter over medium-heat. Whisk in the flour until a paste is made. Slowly whisk in the broth and stir until completely smooth. Then gradually, whisk in the milk and stir until smooth. (Add broth and milk slowly to allow the sauce to thicken). Add the garlic salt, pepper, and dried basil. Cook and stir until the mixture is thick and bubbly. Add in the cream cheese and stir until smooth and the sauce is thickened. Pour the sauce over the veggies and tortellini. Transfer the mixture to the prepared 9 x 13 casserole dish. Cover the dish with foil and bake for 25 minutes. Remove the foil, add the mozzarella and parmesan cheese and broil for 2-3 minutes watching carefully until the cheese is melted on top. I loooove stuffed pastas, especially tortellini! This look indulgent and satisfying, yet at the same time, packed with vegetable goodness 🙂 Pinning! YUM! Nothing I love more than a big pasta bake and all the leftovers you get from them. In the past, I’ve only used normal pasta noodles but I love the addition of using tortellini for extra goodness! Pinned! I absolutely LOVE it when pasta dishes are packed full of veggies and “stuff” haha – this looks wonderful Chelsea! This looks amazing, Chelsea! Love pasta and veggies! I don’t know what it is about tortellini, but I just adore it. Maybe for it’s cuteness? Maybe for the tiny title jewel in the center?? Whatever the reason, I love them, and I love this! I love pretty much any dish that combines cheese tortellini with a creamy sauce. This looks absolutely to die for. Thanks for the recipe-pinned! This bake looks absolutely gorgeous, Chelsea! You really captured summer in this dish. I’m loving all of those fresh veggies and pretty colors! Pinned! This pasta bake looks beautiful, Chelsea! I am totally on board with adding more veggies 🙂 The colors are so bright and pretty – perfect for summer! This is beautiful. The colours are so bright and vibrant. And it is pasta…..I love pasta! The addition of the cream cheese is such a great idea, I can’t wait to try that! I usually just boil my tortellini and I am done, this looks so much better, love all the veggies. Do you think this meal would freeze well? I usually stay away from sauces with dairy in them as far as freezing meals, didn’t know if you had tried it though. I’m sorry, I haven’t tried freezing this dish. I don’t think it would do particularly well being frozen, but I can’t say for sure. Oh that is SO great to hear! Thanks so much for the comment Katie 🙂 And I LOVE the idea of roasting the tomatoes first, I’ll definitely have to try that! The perfect way to use the bounty of veggies coming out of our garden right now! I’m a tortellini lover, too. This looks fantastic and is now in my oven! Can’t wait to taste it! Any tips on turning this into a crockpot meal? Turning on my oven on this hot day was the only downfall. So glad you tried this! I hope you love it 🙂 I’m sorry, I don’t have any tips for changing it over to the crockpot as I haven’t experimented with this recipe in the crockpot. With all the veggies and the tortellini I’m not sure it would be a very good crockpot meal…the oven really makes the veggies crispy which a crockpot can’t do. I don’t often make pasta bakes but when I do – this is how I like to enjoy mine.. loaded with veggies and cheese. Looks awesome Chelsea. Could you prep ahead (say in the morning), then refrigerate, and bake for dinner? Hey! What are y’alls thoughts on substituting the cream sauce for marinara? Do you think it would still work? For the cream cheese, I’m confused about the amount. One 8 oz package? How much cream cheese? One 8 oz package?